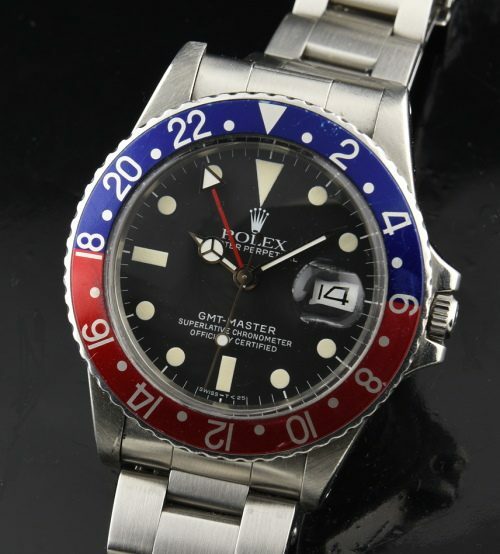 This 7.48 million serial # dates this ROLEX GMT MASTER ref. 16750 to 1982. The original dial is slightly creamy. The hands are a slight bit lighter than the dial lume-barely noticeable and not at all with the naked eye. The bezel and insert are original. This fine watch has the usual (minor) marks from normal use over the years. The ROLEX OYSTER bracelet has the flip-lock clasp. The watch is keeping accurate time after a recent cleaning. We all know how desirable these watches are at this time. The GMT MASTER is truly one of my favourite of ALL watches. Comes With a recent ROLEX CERTIFIED authentication.